About a month ago, my cousin asked me if I would take pictures of her for prom. I told her of course I would! She told me part of it would also involve shooting a group of her friends as they waited for a "party bus" to come pick them up -- and this is the result! It was a bit stressful getting the shot right but taking the extra 15 minutes to do so was totally worth it. I still need to finish the order and send it off to the printer -- so I will post more soon! New: watermarking! I finally figured out how to do it. Yeah! Oh. My. Gosh. This is an amazing photo. I'm SO UNBELIEVABLY GLAD that you figured out watermarking!!! But beyond that, I love this photo because you got all the arms and hands right. Everyone's face shows clearly. Everyone's eyes are open. 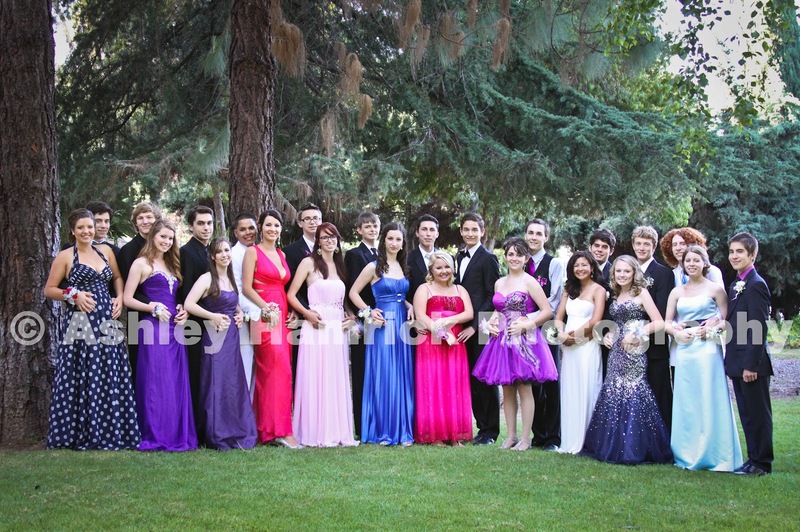 Everyone looks so beautiful. There are no shadows, the lighting is even, the background is present and lovely but makes the group shine. The only thing I thought was, is it crooked? Just the tiniest tilt to the left would make the trees a little more crooked, but the 'horizon' of the group straight across. I think. You're (clearly) the professional. Thanks for sharing and I can't wait to see the others. Oh, I found one more thing I want to say: you don't even notice that there are two more men than women in this group. I found it only after staring at the photo for a while. Perfectly balanced. The colors are vibrant and no shadows! All the faces are accounted for and each with a great smile.